This is my regular, and it's great for having a wide range of options (vegetarian, meat, breakfasty, lunchy, eggs or not). It also does good coffee. Of all the things they have here my favourite is the pumpkin chili hotcakes. They're a savoury twist on pancakes and just delicious. I love the way the dishes here keep changing, nothing seems to be presented the same way twice, but it's always good. The hotcakes come with kumera rosti, kumera chips, avocado and relish and all manner of good things- a veritable feast! Andrew also loves their eggs benedict with salmon, it's served on brioche which apparently makes it stand out from the eggs benedict crowd. They also do some amazing cold drinks. It is pretty much impossible to park near this place, but they do do good food. I think their dinner menu is perhaps better, but we haven't really tested the whole brunch menu, so maybe a return trip is in order. The one time we managed to go there for brunch, I had strawberry crepes (very tasty). Andrew had, of course, eggs benedict with salmon. The portion sizes here are pretty amazing, so a good place to come if you're feeling hungry. 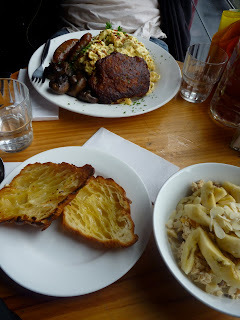 This is a cheerful and fairly large cafe with a good range of options for the fussy bruncher (i.e. me). Plus they stock baked goods from the famous Adriano Zumbo, for instance the croissant you see below. And a bunch of jams and other goods. That all looks so delicious. Brunch is one of the things I really miss about Australia. There isn't much in the way of a cafe culture here, and certainly nowhere that would make something as delicious as those hotcakes or that muesli. Brunch, if it's eaten here at all, tends to be cooked English breakfast served in pubs or milkbar-type places. I just can't get into an English style breakfast- something about facing meat in the morning I think. That's such a shame! At least they should have croissants? I've just had my fourth meal of the day (Invincible hospitality here) and am not very much in the mood for brunch at all. I do approve of the idea of taking it slow on a weekend morning, and looking forward to all those uncommitted hours stretching out in front of you. BTW, isn't Mr Google wonderful - only a few minutes and I had found your blog, even from the depths of Gaza. Hope that Gaza is going well, internet access and all.